Gone are the times when the DSLR camera was beyond the reach of most individuals. 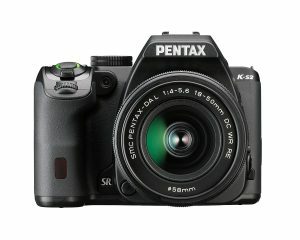 Nowadays, you can come across a camera that still offers the best of DSLR but is more affordable. This is credited to improved technology, cutthroat competition amongst manufacturers and vendors, and also rising interests and growing awareness about the potential and benefits of this camera. However, this doesn’t mean that buying a camera is easy. In fact, due to many types, you may face an uphill task. 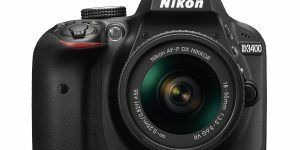 These top 10 popular DSLR cameras in 2019 reviews will enlighten you on why you should choose this camera and after that shed more light on the top choices. Why Go For a DSLR Camera? Better Image Quality: This is credited to the larger and more effective image sensors that support larger pixel sizes. Higher Speeds: Larger image sensors together with faster/ larger ISO allow a DSLR camera to have faster shutter speed as well as minimal grain. Improved Adaptability: the lenses on DSLR can easily be changed to suit different needs and situations. You can opt for wide angle, long focal length, or super long focal length. The experience can be improved through the use of accessories such as flashes and filters. Good Depth of Field: Due to the better manual controls and better image sensors, DSLR has better depth of field. This allows objects at the foreground to be placed in the background and also to achieve a nice blurry background. Retains Value Better: Going by customer opinions, DSLR seem to hold their value better than other alternatives. This is because with a DSLR you don’t need to upgrade or update it too often. It also doesn’t need many extra accessories to provide quality shots. This digital camera comes in a handy size and is also very portable. It comes with 24.3 MP CMOS sensor for shooting high-quality photos. The body is not only strong and durable but also resistant to moisture and dust. This is enhanced by its compact and ergonomic design that makes handling easy. And for easy operation and convenience, this camera comes with Wi-Fi, Bluetooth, and NFC. Dimensions (W x H x D) : Approx. 5.16 x 3.93 x 3.00 in. 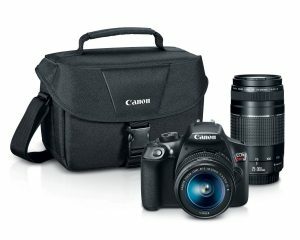 This digital SLR camera by Canon is a regular entrant in top 10 reviews. 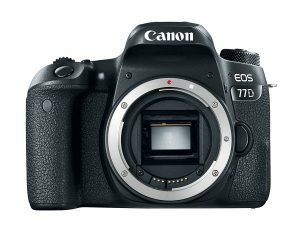 It features a 24.2 MP CMOS sensor plus a DIGIC 7 Image processor that supports higher speeds, faster shutter speeds, and continuous shooting of up to 6fps. The EF-S 18-135mm II Lens together with the 7x Optical zoom effectively places objects in the background. The Optical Viewfinder makes certain the final images are high quality and crispy whereas the built-in flash ensures there is proper lighting. It also comes with Bluetooth, WiFi, and NFC. Weight : Approx 5.57 oz (158 g). Featuring high-quality craftsmanship and advanced features, the Pentax K-S2 20MP DSLR will make every photography session worthwhile. 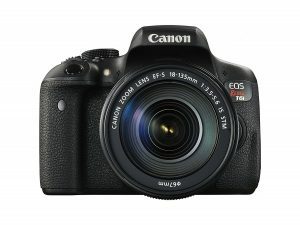 The DSLR comes with a 20MP AA filter-less APS-C CMOS sensor with ISO speeds of up 51,200. For continuous shooting, it can attain 5.4fps whereas the 3.0-inch variable angle LCD display relays the images in high resolution. It is fully weatherproof, coldproof, dustproof and comes with body shake reduction. It captures videos in FHD 1080p @ 30fps. Dimensions (W x H x D) : 4.9 in x 3.9 in x 2.8 in. 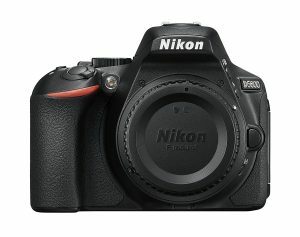 Featuring a focal length of 18-55mm and an aperture of 3.5-5.6G, this digital SLR camera by Nikon is rated among the best. Firstly, it comes with a highly-effective 24.2MP CMOS sensor for taking amazing and high-quality shots. Secondly, EXPEED 4 Image Processor enhances the image quality. Thirdly, it can record full HD 1080p videos at speeds of up to 60fps. Fourthly, the 3.2-inch 1.037m Dot variable angle Touchscreen improves the user experience. Other worthy features are WiFi, SnapBridge Bluetooth, and NFC. 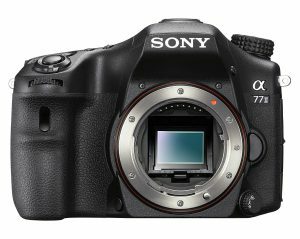 The Sony Alpha a77 II is not only well-built and trendy but also among the simplest to use. It comes with a sturdy body that resists moisture, dust, low freezing temperatures and more. The unit features a large 24.3 MP APS-C sensor that is up to 20% more sensitive and less noisy compared to the earlier version. It also comes with wider sensitivity range (ISO 100-25,600), latest RGB color filter, and gapless on-chip lens. Together with the latest technologies such as superb subject tracking and OLED True-Finder, this Sony camera will allow you take the perfect shots using the least effort and time. Dimensions (W x H x D) : Approx. 5.20 x 3.98 x 3.07 in. The Canon Rebel T6i features ISO 100-12800 that can be expanded up to 25600. It shoots at speeds as high as 5fps and comes with the famed 24.2MP CMOS Sensor and 19-point cross-type AF for superb autofocus performance. The high-speed processor supports high shutter speed, continuous shooting, and minimal drag or delays while the EOS Full HD Movie format relays videos in MP4 format. It works with 18-135mm Image Stabilizer STM lenses and support with Canon EF and EF-S lenses also comes with Wi-Fi, when used with the Camera Connect mobile app users and NFC connectivity can be paired to compatible mobile devices quickly. Dimensions (W x H x D) : Approx 5.08 x 3.99 x 3.06 in. Although not new in the market, this DSLR stands out as one of the popular ones in the market. Many people love its high-quality images that are made possible by the 18.0MP CMOS sensor, high-performance Optical Viewfinder, 9-point Autofocus system, and the DIGIC 4+ Image processor. 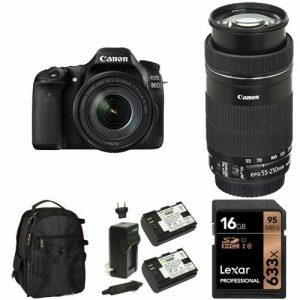 It comes with 18-55mm and EF 75-300mm lenses. Although rated as ISO 100-6400 it can be expanded up to 12800 in low light situations. For easy sharing of content with other devices, it features WiFi, NFC, and Canon Connection Station CS100. 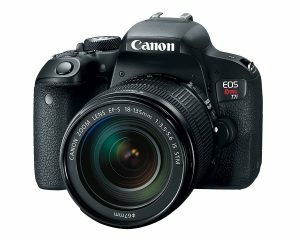 The Canon EOS 80D Digital SLR Camera is praised for producing quality images without needing extra accessories. This is credited to the top grade lenses (EF-S 18-135mm and 55-250mm), Superior Image Stabilization and reliable USM. It features a moisture and dust resistant body that ensures the internals are well protected from the elements. Faster AF, improved color, better response time, and minimal noise is guaranteed by the quality processor chip whereas the 16GB provides a good storage point. It comes with a 2-pack Wasabi Power battery, Canon charger, and Image Rescue Software. 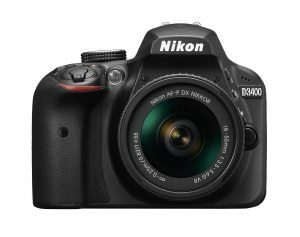 You can take your photography a notch higher by using the Nikon D3400 DSLR Camera. Boasting of a Nikkor 18-55mm zoom lens, the camera can shoot at 5fps and comes with an EXPEED 4 Image Processor. The lens minimizes the vibrations and this leads to sharper and blur-free images while the 24.2MP sensor delivers quality pictures. The sleek and stylish digital camera also comes with Native ISO 100-25600 functionality, SnapBridge Bluetooth Connectivity, 8x digital zoom and both manual and auto exposure control. Regarded as one of Canon’s top sellers, this camera is feature-rich. It comes with Canon EF-S 18-55mm & 55-250mm telephoto lenses and a wide angle of 18mm for taking the perfect shot. It relies on an 18MP APS-C CMOS sensor and a Digic 4 Image Processor to record videos at 30fps and shooting at 3fps. Guided by the above review, choosing the right DSLR camera shouldn’t be a problem anymore. All you need is reading the top 10 popular DSLR cameras in 2019 review and making a pick. All the cameras score highly in regard to reliability, image quality, and depth of field, speed, and adaptability to different situations. They are also backed by overwhelming reviews from previous and current users and this should give you peace-of-mind knowing you own the best product. 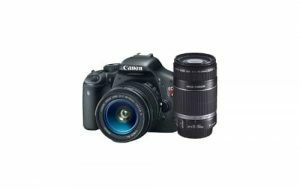 Make your photography enjoyable and worthwhile by choosing the best DSLR camera.